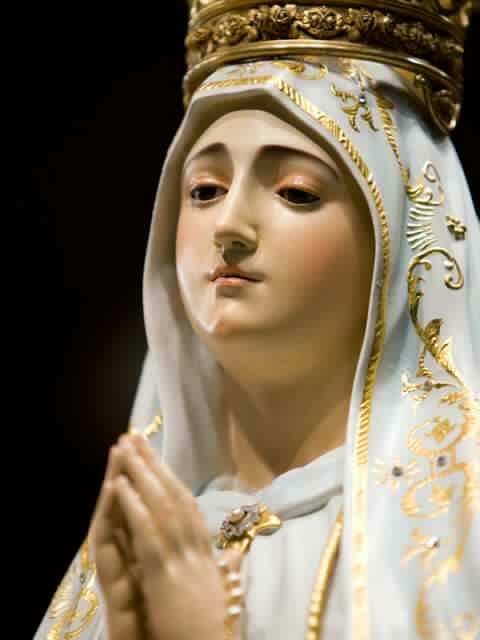 This day, July 13, exactly 95 years ago, Our Lady opened Her hands as She had done on Her previous visits. However, there was no divine light revealing the love of God and His sorrow for sin, or the Immaculate Heart of Mary, wounded by thorns of sin. Instead, the children saw the rays of light from the Woman’s hand penetrate the earth to reveal the justice of an offended God: a sea of fire. It was hell: the place of everlasting punishment originally prepared for the devil and his angels (Mt. 25.41). Thus, anticipating the diabolical warfare of subtle deception – the “diabolical disorientation” – under the guise of the New ‘Catholic Theology’, to be diffused out of the Vatican itself forty-five years later (the “New Evangelization: [g]od loves and heals UNREPENTANT sinners,” cf., our post “The Ultimate Delusion of Vatican II ‘Catholicism'”), the Great Sign of the Apocalyptic Battle (Apoc. 12) offers us the first line of defense against the deceitful ancient enemy: Therefore take unto you the armour of God, that you may be able to resist in the evil day, and to stand in all things perfect. Stand therefore, having your loins girt about with truth… In all things taking the shield of Faith, wherewith you may be able to extinguish all the fiery darts of the most wicked one (Eph. 6.13,14,16). Whom resist ye, strong in Faith (1 Pet. 5.9). And this is the victory which overcometh… our Faith (1 Jn. 5.4) which infallibly teaches that the true God is the God of BOTH justice AND mercy: mercy and wrath are with Him. Our Immaculate Mother therefore bids us as the Word of God does: Stand fast; and hold the traditions [Gk: paradosis] which you have learned, whether by word, or by our epistle (2 Thess. 2.14). If any one preach to you a gospel other than which you have received, let him be anathema (Gal. 1.9). This entry was posted in Christian Life, Devotions, Sacred Scriptures, The Blessed Virgin Mary, Traditional Roman Catholic Order and tagged Apocalypse, Blessed Virgin Mary, Catholic Tradition, Catholicism, Christianity, devil, devotions, diabolical disorientation, divine justice, divine mercy, faith, hell, Immaculate Heart of Mary, New Catholic Theology, Our Lady of Fatima, Sr. Lucia, Vatican II. Bookmark the permalink.